Are you a parent of an adult or high school student with ASD who is Hispanic or Latino? Your Input is Needed! If you live in a different county in Florida, find your CARD here. Our offices are located in the University of Florida's East Campus Building. Our office hours are Mondays 1pm-5pm, and Tuesday-Friday 9am-5pm. You can call us Toll Free 1-(800)-9-AUTISM or Local (Gainesville Area) (352)-273-0581. We look forward to seeing you! Please note that CARD may be considered an agency of the State of Florida and that certain records of CARD may be considered public records, which are subject to the Florida Public Record law. Under Florida law, e-mail addresses are public records. The mailing list is not shared with any other agency, individual, or entity outside of CARD unless required by law. Are you missing our eNews? Please check your spam / junk folder! Ensure you receive our eNews by whitelisting emails from @ufhealth.org and @ufl.edu. Please see your email provider's help page for details on how to perform this task. 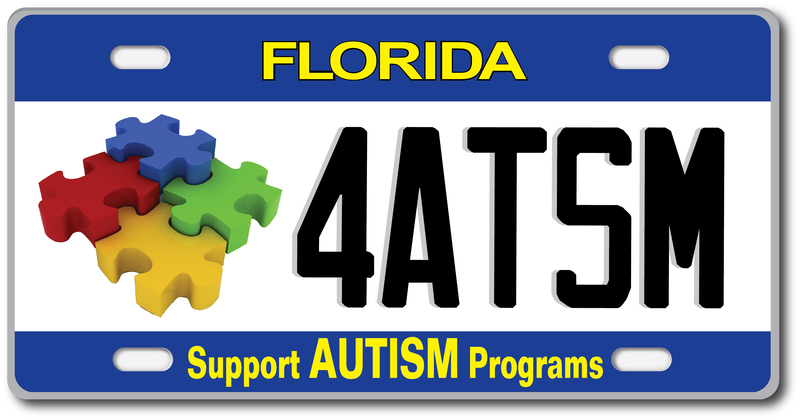 Get your Florida Autism License Plate!